Need help with Tango Card? Read on for some common Q&A! Solution: After adding a credit card for the very first time, you will not be able to add funds for 24 hours, while Tango Card authorizes it. If you need this done sooner, you can contact Tango Card Support and ask them to expedite the process. Solution: Contact Tango Card Support to ask them to send it to you. You may also need to ask them to update the email address on your account if it is not where you want to receive receipts. Solution: If a redemption fulfillment failed, you will be given an alert on the Dashboard. If you only click the Retry Fulfillment button on the Dashboard, it will not trigger the retry. It will only take you to the window where you need to click the Retry Failed Redemption button again. Check to see if the Retry is successful by going to the Logs tab in the Tango Card Integrations page. Solution 1:Check to see if your account runs out of funds. If you are then your advocate will not receive the automatic redemption email. 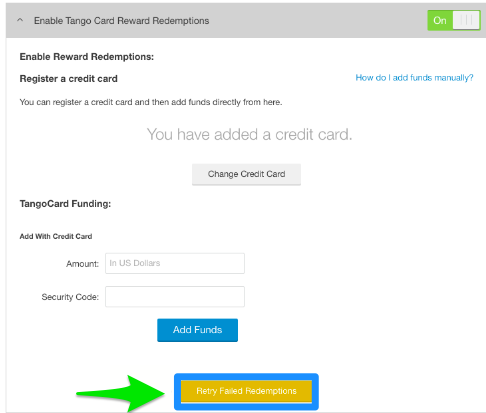 In order to send them the redemption email, you will have to add funds to your account, then click the Retry Failed Redemption button under the Settings tab in the Tango Card Integration. If you have the Administrator Approval Required checked in the rewards' setting then you need to manually mark the reward as fulfilled. 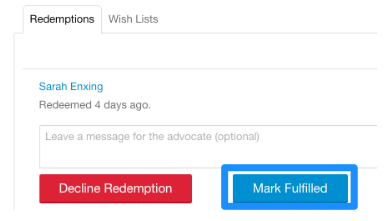 Your advocate's will receive the email once you mark the reward fulfilled. Solution 2: If your account already has funds, the most common case here is that the email ended up in their spam/junk folder so please ask the advocate to check there first. Solution 3: If the email is not there, you can contact Tango Card support with the details of the redemption and ask them to resend the card, and cc you on the email in case its getting blocked. This way you could send the card to the advocate yourself. Solution: Tango Card doesn't allow rewards that have been sent out to be cancelled or reverted. However, one thing you could do instead is ask the advocate to send you the email they received with the Gift Card and ask that they do not redeem it in the future. You can then perk them the Tango Card they meant to redeem. Check out this article for how to perk a reward. In the future, you could perk/send the accidentally redeemed card to another advocate. The e-mail address of your advocate who has not received the reward. Which gift card they redeemed and when they redeemed it. Once you email Tango Card, they will send your advocate a new copy of the redemption email.